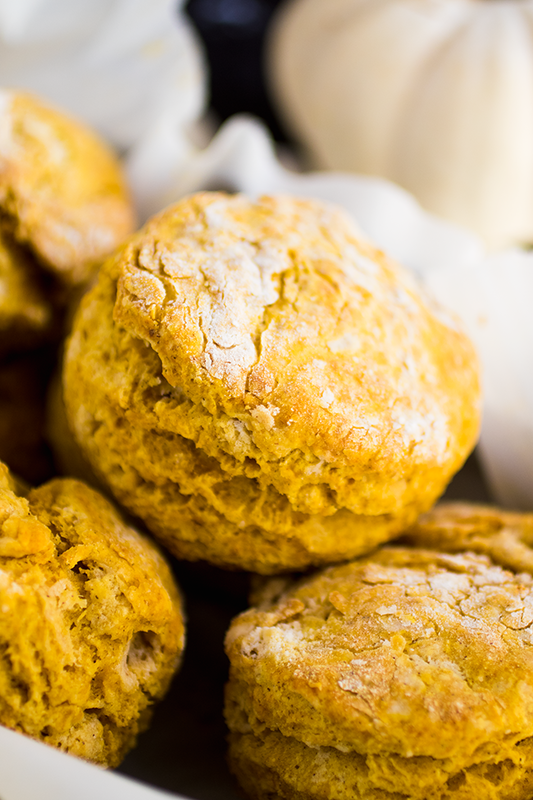 These quick and simple pumpkin biscuits are perfect for fall! 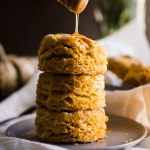 Pumpkin puree, plenty of butter and a little bit of cinnamon create the perfect flaky, satisfying pumpkin biscuit recipe for breakfast or brunch. Vegetarian. I think it’s time for a pumpkin recipe, don’t you? The crazy summer heat we’ve had for the last few months has finally broken, and while I’m shedding some very real tears over the forced retirement of our little backyard garden patch (RIP TOMATOES), I’m kiiiiiiiind of pumped that I get to bake things again. Turning on the oven in 100 degree heat is a bit of a no-no, so you can bet your biscuits (SEE WHAT I DID THERE) that I’m making up for lost time now that there’s a bit of a chill in the air and we won’t, y’know…melt. And, okay, it’s really no secret that I have a thing for biscuits. 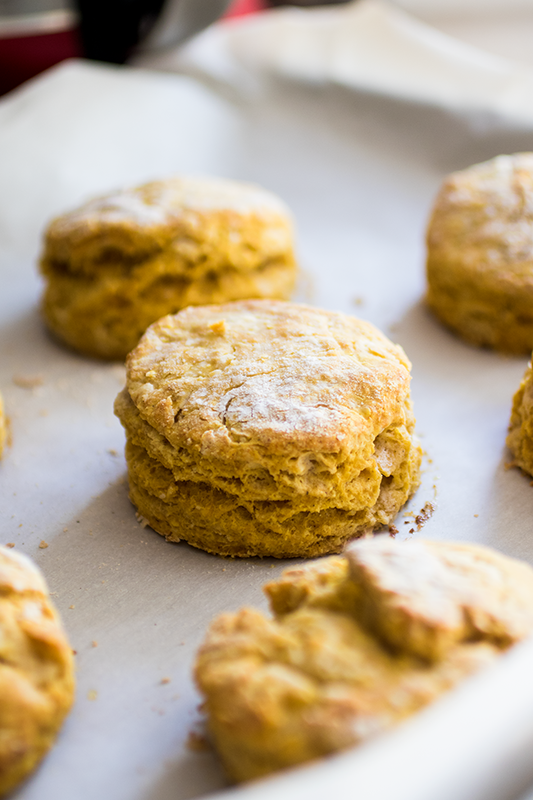 Cheesy Biscuits, cornbread biscuits, vegan biscuits, beer biscuits…you catch my drift. We’re all biscuit BFFs over here. 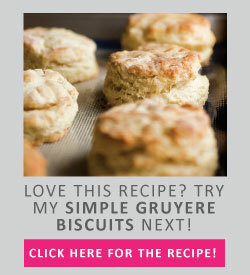 But these biscuits, you guys – THESE BISCUITS might very well be my new favorites. They’re just so delightfully FALL. There’s just enough pumpkin and cinnamon here to fill the whole house with ALLLLLLLL the best baking smells without feeling like you’re eating an overly-sweet dessert biscuit. (Although…..DESSERT BISCUITS??? I think we might be onto something here). These are great with a quick drizzle of honey, as part of a biscuit-y breakfast sandwich, or as the base for some brunch-tastic eggs benedict. Also encouraged: eating them à la carte right off the baking sheet. There’s no judgment here. 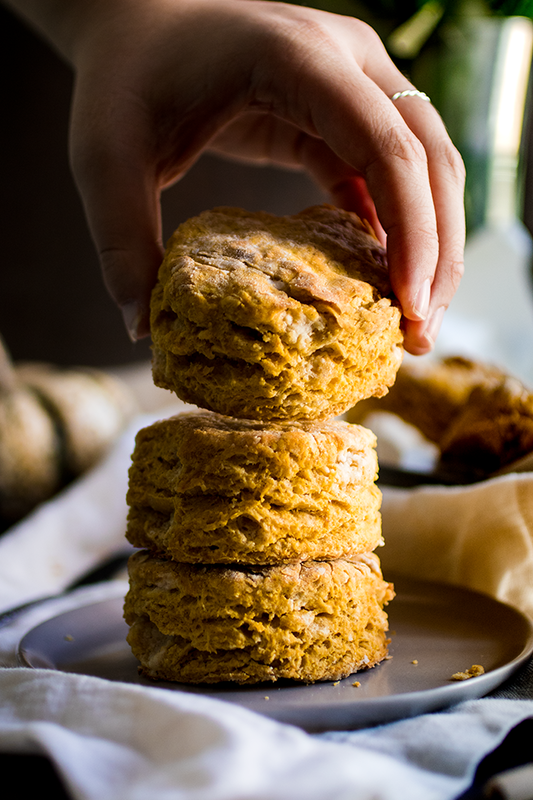 Tasty pumpkin biscuits – perfect for fall! 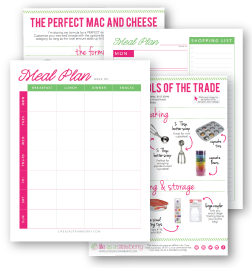 Preheat oven to 450 degrees F. Line a large baking sheet with parchment paper or a nonstick baking mat. In a small bowl or measuring cup, whisk together pumpkin puree and milk until you have a smooth mixture. Set aside. Add cold cubed butter to flour mixture and cut it into the mix with your hands or a biscuit cutter until the mixture is coarse and resembles cornmeal. (If you’re unfamiliar with this process, you basically just quickly rub the butter into the flour with your hands until the mixture is coarse and the butter has been broken up into small pieces). Add milk and pumpkin mixture to flour and stir until everything is just combined. The dough shouldn’t be completely smooth – we want to keep lots of butter pieces in there so the biscuits will be nice and flaky. Turn biscuit dough out onto a floured surface. If the dough is too sticky, gently fold in a tablespoon or two of flour. I like to gently fold my dough over on itself several times, so I have lots of butter layers working for maximum flakiness. Roll or pat dough to about 2/3″ thickness and cut biscuit rounds with a 2″ biscuit cutter. Place biscuit rounds on your parchment-lined baking sheet and bake at 450 degrees Fahrenheit for 10-15 minutes until lightly browned. Serve immediately with butter and honey. 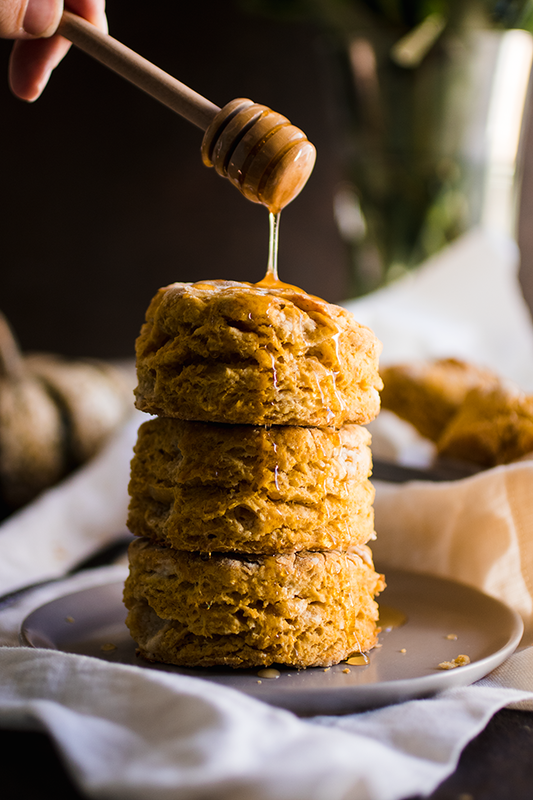 Water content can vary when you’re working with pumpkin puree – if your biscuit dough looks too dry, gently stir in a splash of milk. Too moist? Fold in another tablespoon or two of flour. Yo, this recipe is amazing! So easy, just make sure you have a pastry cutter for ease with the butter. I put apple butter on mine and they are to die for!! Hi Debbie! YUM, that apple butter idea sounds yummy. Thank you! I added pumpkin spice instead of cinnamon, about 2 tps. I couldn’t really taste pumpkin really though. Any suggestions? Great texture!!! Great recipe. First batch like hockey pucks because not folded enough after pouring out of bowl. Second batch much better after I poured out onto parchment paper and folded a few times adding flour as I went. Next time I will add more folded layers for more flaky layers. I also added full tsp cinnamon and 2TBSP sugar for personal flavor preference. Um, I don’t know if I’ve ever seen or even thought of such a perfect combination. These look absolutely INCREDIBLE! Cannot wait to try them! I’m 100% making these, though I’m not confident I can achieve those INSANE flakes like you do. I struggle with biscuits, man. And it pisses me off! I can make the flakiest pie crust this side of the mason dixon, but for whatever reason biscuits elude me. I think I just need more practice… to the kitchen I go! Oh maaaaan – I’m not great at pie crust, so maybe we need a baking day soon and we can help each other out, eh? ?